Police arrested Eulalio Tordil, 62, around 3 p.m. in Aspen Hill, Maryland. WASHINGTON — After police observed a suspect wanted in three shootings in Prince George’s and Montgomery counties, police arrested him Friday in connection with the incidents. Police arrested the suspect wanted in Thursday’s fatal shooting at a Prince George’s County high school in the Aspen Hill area Friday afternoon. At a press conference, police said they have “reason to believe” the suspect also was involved in Thursday’s shooting and two fatal shootings in Montgomery County Friday — one at Westfield Montgomery Mall and another near an Aspen Hill grocery store. Police arrested Eulalio Tordil, 62, around 3 p.m. in Aspen Hill. Tordil will be brought before a Maryland commissioner and arraigned at 1 p.m., Monday. Police said on Thursday, Tordil followed his estranged wife, 44-year-old Gladys Tordil, onto High Point High School property and shot her. Gladys Tordil, a chemistry teacher at Parkdale High School, died later. A male bystander, who witnessed a confrontation between the two, tried to intervene when Eulalio Tordil shot him, striking him in the shoulder. The bystander sustained non life-threatening injuries. Prince George’s County Police have charged Tordil with first-degree murder and related charges in connection with the fatal shooting of Gladys Tordil on Thursday. 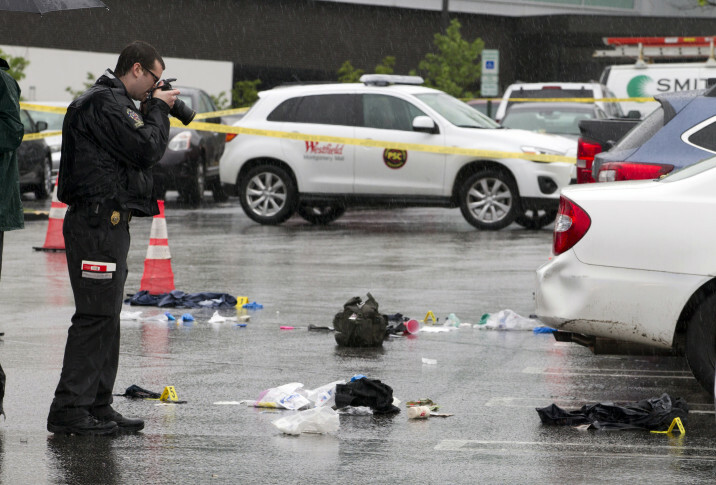 On Friday, a preliminary investigation found one person was shot in the Westfield Montgomery Mall’s parking lot around 11:15 a.m. after a confrontation, and two people who came to the victim’s aid were shot as well, said Assistant Montgomery County Police Chief Darryl McSwain. One man died as a result of his injuries outside the mall. Another man is in grave condition and a woman is being treated for non-life threatening injuries. Around 11:50 a.m. Friday, a shooting was reported near an Aspen Hill grocery store — fewer than 10 miles from the mall shooting scene. A woman was sitting in her car when she was shot and killed in the 13700 block of Connecticut Avenue near the Giant. The woman’s name has not yet been released. According to law enforcement sources, Tordil had last been seen in a rental car — a silver 2015 Hyundai Elantra with Pennsylvania plates JZA0123. The sources said he wanted police to kill him. Officers saw a vehicle matching the description and later saw Tordil at a Dunkin Donuts in Aspen Hill. Before his arrest, Tordil ate lunch at the same Boston Market where Beltway snipers Lee Boyd Malvo and John Allen Muhammad ate after they started their 2002 shooting rampage. Montgomery County Public Schools, which had been sheltering in place, were dismissed on time. Watch video of Tordil being arrested below. WTOP’s Megan Cloherty contributed to this report from Bethesda and WTOP’s Kristi King contributed to this report from Aspen Hill. WTOP’s Colleen Kelleher contributed to this report from Washington.